The giving of a wedding ring is a commitment between a couple forged forever. Your wedding ring will be worn on your hand every day for all to see. Nick understands the significance of this commitment and his hand made Diamond Wedding Rings reflect this. Having your diamond wedding ring custom made means any design is possible and will always be made to match your engagement ring perfectly. From a simple classic wedding band to an intricate multi set diamond wedding ring any design is possible handmade in our Brisbane jewellery workshop. Make an appointment with Nick and come in for an obligation free viewing and fitting of his large range of ladies diamond set wedding rings. 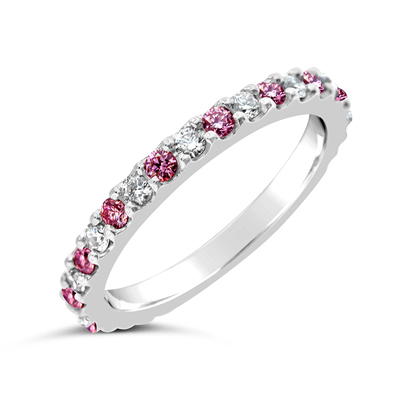 From multi coloured gold wedding bands to white,pink and colored diamond wedding bands we can provide you with a uniqe handmade wedding ring you will be proud of. The Diamond Jewellery Studio have a great selction of mens wedding rings available including white, yellow and rose gold, platinum, tungsten, titanium and a brand new carbon fibre mens wedding range. For gents wanting some bling we have a fabulous selection of mens diamond set wedding rings and as all our wedding rings are custom made anything is possible. We can incorporate any pattern and finish into our wedding rings including laser etching each others fingerprints to the inside of your wedding rings for a truly personal touch. If you are looking for a wedding ring as individual as you, make an appointment with Nick in either his Brisbane jewellery Studio or Sydney/Melbourne offices and let him design your perfect Wedding Ring at an affordable price.